First generation genetically encoded, ratiometric, fluorescent biosensor. Zn(II)-binding domain derived from mammalian Zif268. mito-ZifCY1 contains 4 tandem repeats of the first 29 aa of human cox subunit 8a (MSVLTPLLLRGLTGSARRLPVPRAKIHSL). 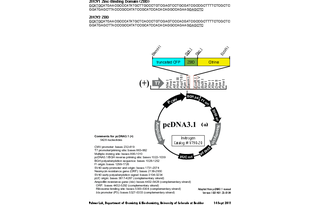 HindIII restriction sites are at the 5' and 3' ends of the mitochondrial targeting sequence.